Flaxseeds are one of the best superfoods, which are great for both nutrition as well as beauty. 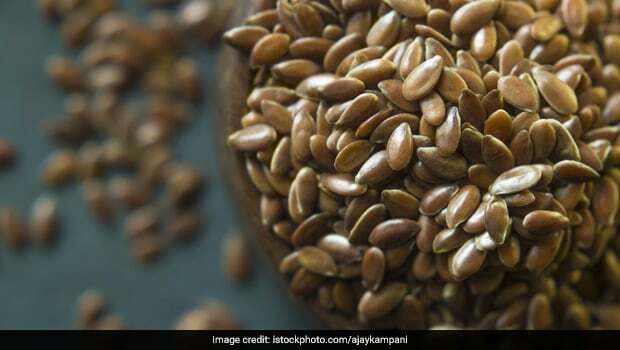 Although they have been getting a lot of traction for their health benefits lately – not many people know that flaxseeds are one of the earliest crops cultivated by humans. Flaxseeds are said to be rich in macronutrients like proteins and fibre, as well as micronutrients like a number of essential minerals and vitamins. They are also rich in omega-3 fatty acids and are widely consumed in numerous ways like salads, smoothies (flaxseed powder) or even raw or roasted. Flaxseeds have become popular as a healthy weight loss snack as well. But did you know that these unassuming shiny seeds can also help you in getting smooth, healthy and gorgeous hair? Flaxseeds are rich in a number of nutrients that may help in keeping the hair healthy and the scalp hydrated. What’s more? Flaxseed hair mask is easy to make and gives you results comparable to a hair spa treatment in salons, given that you generally take care of your hair and a follow diet and beauty regimen that is healthy for your hair type. This is why flaxseeds are found in a number of hair creams that you can buy from stores as well. 1. Rich In Vitamin E: Flaxseeds are rich in vitamin E, which is great for both skin and hair health. The nutrient promotes the health of the scalp by reducing free radical damage. It helps improve circulation in the head, thus promoting hair growth and slowing down hair breakage. It may also help prevent premature greying of hair. 2. Rich In Omega 3 Fatty Acids: Flax seeds are also rich in omega-3 fatty acids, which are known to be great for the skin and hair, as they keep them nourished and prevents hair drying, especially during winters. Some studies have shown that omega 3 may help prevent hair loss and thinning of hair, as well as dry scalp and even dandruff. 3. Reduces Brittleness: The nutrients in flaxseeds may prevent hair breakage by improving elasticity of the hair strands. Both consumption and topical application of flaxseeds may help improve the quality of your hair substantially. 4. Nourishment For Hair And Scalp: Flaxseeds act on both hair and scalp, due to the presence of nourishing nutrients like B vitamins, magnesium, manganese, selenium and copper. These nutrients boost hair growth and help them grow stronger and longer. Flaxseeds can be used to promote hair growth and improve the overall quality of hair and scalp in a number of ways. You can also buy flaxseed oil and apply it on your scalp and hair for a natural hair spa treatment. You can also work with flaxseeds by making a gel out of them. All you need to make this all-natural gel for hair growth is some flaxseeds, filtered water and optionally, a little aloe vera gel or some essential oils like argan oil or jojoba oil. To begin, put the water in a pot and add the flaxseeds to it. Let the mixture come to a boil while stirring continuously. You will see the mixture thickening and a light white froth will begin to form in it. Allow the mixture to cool completely and filter it out using a cheesecloth or a muslin cloth. To the filtered gel, add some aloe vera gel or an essential oil of your choice. If you have particularly dry scalp and dull, lifeless hair, apply the resulting gel to your hair every day, in order to keep your hair conditioned and healthy. The gel may promote hair growth and also protect your hair against negative effects of pollution, dust, etc. Make sure you consult your dermatologist for advice on the quality and choice of ingredients you are using to prepare this hair growth gel.